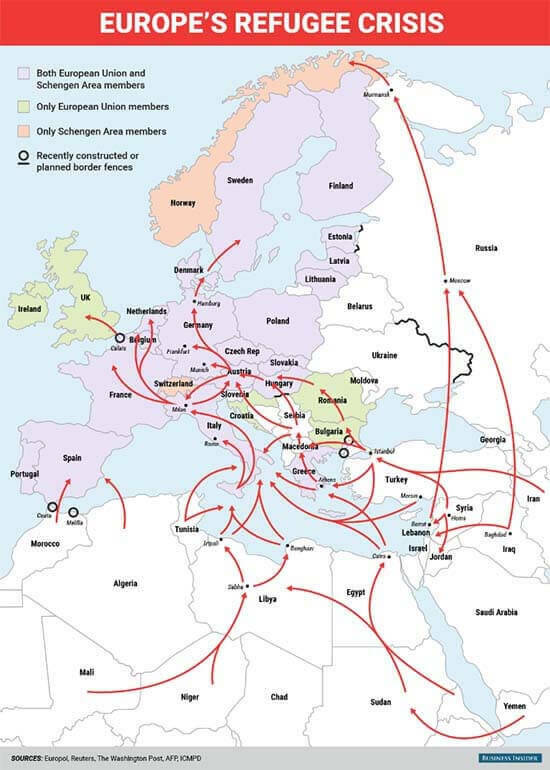 EU Refugee Crisis Is "the Single Biggest Threat to Your Money Today"
Subject: EU Refugee Crisis Is "the Single Biggest Threat to Your Money Today"
The desperate EU refugee crisis is a humanitarian emergency, a logistical nightmare, a political hot potato, and a security risk. And investors need to prepare for what's coming. "The migrant crisis is by far the single biggest threat to your money today. You're not hearing about this at the moment, but you will in the months ahead," Money Morning Chief Investment Strategist Keith Fitz-Gerald told his Total Wealth research service readers on Sept. 16. Fitz-Gerald called the situation in Europe considerably more dangerous than an impending Fed rate hike, and much more worrisome than China's economic slowdown. "As was the case in 2007 with the Financial Crisis when most viewed it as a localized $300 billion problem and I warned you otherwise, the refugee crisis is a truly global situation, the seriousness of which is unparalleled in modern times," he said. "Already strained public finances are going to get crushed – that's not yet registered for most people." 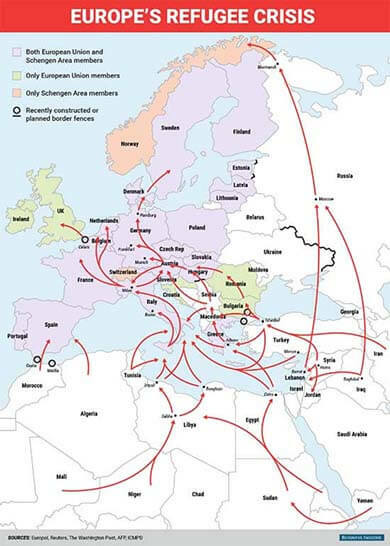 According to the International Organization for Migration (IOM), more than 350,000 migrants were detected at the EU's borders just from January to August 2015. That compares with 280,000 detections for all of 2014. The estimate does not include the many that got in undetected. Eurostat reports that the EU never settled more than 7,400 refugees a year between 2008 and 2014. Germany alone, which receives the most asylum applications in the EU, is expecting 800,000 refugees to arrive this year. According to the United Nations (UN), roughly 3,000 people are expected to cross into Macedonia every day in coming months; more than 34,000 migrants were detected crossing from Serbia into Hungary in July alone. "Put very simply, the refugee crisis is the largest single human movement in Europe since WWII, and a religio-sociographic earthquake the likes of which the world hasn't seen for centuries," Fitz-Gerald said. In the short-term, Fitz-Gerald expects humanity concerns will collide with housing needs and integration. "Already strained public finances are going to get crushed – that's not yet registered for most people." Fitz-Gerald believes if Europe is to pull out of this, its self-interested officials must involve business leaders and private finance in making rapid policy changes. That's because business leaders are far more direct than their political counterparts. "Europe's got about 60 days to figure things out before the markets do," Fitz-Gerald said. "I say that because it'll take about that long for quarterly reporting to reflect what's happening right now." The short-term effects are already apparent. Closed borders are already causing traffic jams, delaying rail traffic, and overloading local distribution systems. There are huge backups everywhere from border crossings to the Chunnel. "Grocers and pharmacies are particularly at risk with their emphasis on just-in-time delivery," Fitz-Gerald said. Medium- and long-term effects could include an even faster decline in earnings than is underway now, a precipitous drop in cross-border business transactions, and a slowdown in manufacturing and purchasing that boomerangs back to China – one of the EU's key trading partners. "We're also going to see nations decrease benefits," Fitz-Gerald said. "You'd think that they'd be increasing them, but actually I think we're going to see the opposite because resources will be extremely strained." Fitz-Gerald cited Denmark as an example of this. The country has already declared a new "immigration benefit" of 5,945 kroner for single adults with no children. That's down 45% from the 10,849 kroner that used to be offered to asylum seekers. That nation also published ads in four Lebanese papers declaring the changes in an attempt to stop smuggling before it begins, or at least redirect it to other more generous countries. "Barring a massive policy change and a unified front from EU leaders and the business community, I see two distinct scenarios," Fitz-Gerald said. "In the short term, U.S. Treasuries are going to remain strong and the dollar gets even stronger as part of a flight to safety. This will confound Yellen for obvious reasons." "Longer term, the economic chaos associated with millions of refugees will result in a good number of bargains in everything from Greek olives to French wine, German cars, and Italian leather. Consumers are going to have a field day." The Bottom Line: The refugee crisis poses a threat to your money, but it does not have to be a disaster. "There is always opportunity in chaos," Fitz-Gerald said. "Funds like the PIMCO Strategic Income Fund (NYSE: RCS) with its yield of 12% are a great place to start, as is the PowerShares DB US Dollar Index Bullish (NYSEArca: UUP), which will appreciate as the dollar strengthens." "And rather than target individual companies, swooping in to grab a little of everything makes more sense. The Fidelity Spartan International (FSIIX) is a solid start, with holdings like Nestle SA, Novartis AG, Bayer AG, and Royal Dutch Shell Plc. If ETFs are more your style, consider the Vanguard FTSE Europe ETF (NYSE Arca: VGK), which holds a total of 514 stocks, including many of the same top-tier names I've just mentioned. Your goal is to pick up the best companies tied into global trends at a deep discount." Editor's Note: Keith's investment strategy is built to help you seize on investment opportunities others don't yet see or even understand, and reading trading tea leaves is just the beginning of that. He's identified six Unstoppable Trends that power investments to new heights, and his very first recommendation to Total Wealth readers was backed by three of them. It returned gains of 100% within six weeks of his recommendation – and it still has several doubles on the horizon by Keith's calculations. To get a no-cost report on the company – including ticker symbol – click here to sign up for Total Wealth – it's free! Europe MUST start sending these people back…..because many of them are dangerous. 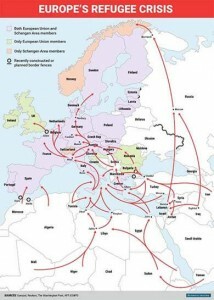 ISIS is using this disaster of THEIR creation to send a 5th column into Europe. There is no way to evaluate these people. Send them back and pay to set up camps. That is the only way. And finally……put out the message daily…..NO MORE INCOMING WILL BE ACCEPTED….PERIOD. OTHERWISE, THEY EUROPE WILL BE DESTROYED. Your headline is wrong in my case, my biggest threat to my finances is "my wife"